If I Do 40 Minutes of Cardio 5 Times Weekly Will I Lose Weight? Toby Pendergrass began writing and editing in 1998. He has served as editor for numerous custom health publications and physician journals. His work has appeared in publications such as Hospital Corporation of America's "YOU." He enjoys writing about cardiology and cancer care and holds a Bachelor of Arts in communication from the University of Tennessee at Chattanooga. High blood pressure, arthritis and certain types of cancer are all more common in people who carry excess body fat. An effective plan for weight loss begins with a low-calorie diet followed by regular exercise throughout the week. Doctors typically recommend cardiovascular activity -- or exercise that forces your heart to work at a faster pace -- as the ideal fitness method to lose weight. Recognize how much exercise you need in order to shed unwanted pounds and return to a healthy body size. While movement of any type benefits your health, aerobic activity, commonly referred to as cardiovascular exercise, represents the most effective way to lose weight. Cardiovascular workouts that require you to use the large muscle groups in your body repeatedly burn a greater amount of calories than activities like weightlifting and also improve the way your heart pumps blood. For example, running at six mph will burn 372 calories in 30 minutes for a person who weighs 155 pounds. But, 30 minutes of the relatively low-impact tai chi, burns only 149 calories. Using an online "calories-burned" list, like the one offered at Harvard Health, will help you choose the activities that will burn the most calories. Most fitness instructors recommend cardiovascular exercise up to five days weekly for between 30 and 60 minutes as an ideal regimen to lose weight. While exercising for the minimum of 30 minutes will produce some level of weight loss, your body benefits should increase with workouts of 40 minutes or longer, especially if you maintain a nutritious diet. Dividing your workouts into smaller segment is also effective. People who wish to exercise for 40 minutes daily but don't have time for a continuous workout can achieve the same benefits through a 20-minute bike ride in the morning and a 20-minute ride in the evening. Since consistent cardiovascular workouts are necessary to lose weight, start your exercise plan by choosing activities you'll look forward to performing. Brisk walking offers convenience and safety, although sports like basketball, tennis and soccer are also aerobic methods. Bicycling is an ideal exercise for people who have orthopedic challenges or are 50 pounds or greater over an ideal body weight. While swimming is also a popular aerobic activity, aquatic exercise is unlikely to produce as much weight loss as workouts away from water. Cardiovascular workouts can decrease the size of your waistline, but you'll still need to eat healthy and perform other types of activity to lose as much weight as possible. Carving out time to lift weights for at least 20 minutes on three days weekly adds to your lean muscle but lowers your overall fat and improves the calorie-burning ability of your body. A balanced diet is the cornerstone of any weight loss plan and should include daily consumption of whole-grain breads or cereals, fruits, low-fat milk products and vegetables. Check with your doctor before starting any exercise and diet to lose weight, especially if you have a serious health condition like high blood pressure. 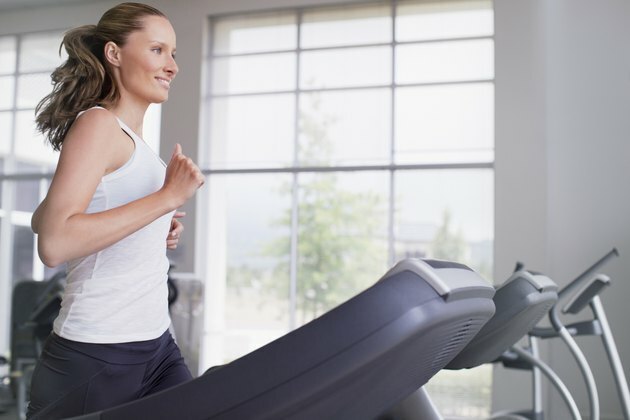 Cleveland Clinic: What Is The Best Type of Aerobic Exercise? Stationary Bike Workout: How Long? What Are Some Different Types of Exercise?